If we ever memorize a verse of Scripture, it will most likely be John 3:16. It is the verse most often heard in the simplicity and beauty of a little child’s voice proudly reciting it from memory. John 3:16 is the one verse showing up on large placards at football games and other major sporting events. Those signs are located where television cameras cannot avoid its message. This is the one verse that has been spoken by many older saints as they breathed their final breath. John 3:16 is the entire gospel in a nutshell. Angel Martinez, the late evangelist who had memorized the entire New Testament, referred to John 3:16 as salvation’s formula and observed that it contained four very insightful truths. It is the gospel in one verse. John 3:16 reveals to us salvation’s cause, its cost, its condition, and its consequence. Salvation is not spelled “d-o,” but “d-o-n-e.” Many people, however, think their own good works are the pathway to eternal life. Consequently, they do this or do that, or they don’t do this or don’t do that, all in order to earn salvation. But our salvation is done. It is already purchased for us with the blood of Christ on the cross. Our part is to believe, to transfer our trust from ourselves and our own efforts to His finished work on the cross of Calvary. To believe does not mean to simply give intellectual assent to the claims of Christ. It means to transfer our trust to Him alone for our salvation. I believe in George Washington, but I don’t believe on him; I don’t trust my life to him. Salvation’s condition is through faith — and faith alone — in the finished work of the Lord Jesus Christ. What a consequence! What a promise! Those without Christ are perishing, but those in Christ have the eternal promise of “everlasting life.” This comes not from our own human efforts, morals, or good deeds, but the promise is to those who realize that God’s love reaches down to us, was made possible through the payment of Christ, and is received by grace through faith alone; believing in the Lord Jesus Christ. 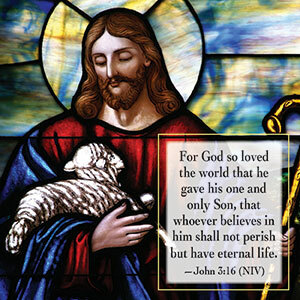 everlasting life… the greatest possession. As you memorize John 3:16, this old and oft-repeated verse, meditate on the fact that love is always something you do and remember that “God so loved the world that He gave.” Yes, God knows you, loves you, and has a wonderful plan for your life. You probably are not surprised to learn that John 3:16 is the most-searched Bible verse. But, have you pulled it apart to really soak in the treasures of every word of this powerful verse? Leave a comment on our blog about God’s amazing gift of love through Jesus Christ! We love hearing from you!